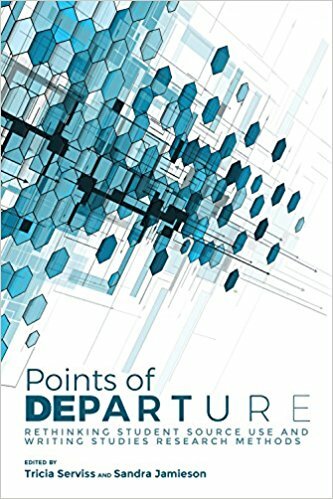 Abstract: Points of Departure encourages a return to empirical research about writing, presenting a wealth of transparent, reproducible studies of student sources. The volume shows how to develop methods for coding and characterizing student texts, their choice of source material, and the resources used to teach information literacy. In so doing, the volume advances our understanding of how students actually write. The contributors offer methodologies, techniques, and suggestions for research that move beyond decontextualized guides to grapple with the messiness of research-in-process, as well as design, development, and expansion. Serviss and Jamieson’s model of RAD writing studies research is transcontextual and based on hybridized or mixed methods. Among these methods are citation context analysis, research-aloud protocols, textual and genre analysis, surveys, interviews, and focus groups, with an emphasis on process and knowledge as contingent. Chapters report on research projects at different stages and across institution types—from pilot to multi-site, from community college to research university—focusing on the methods and artifacts employed. A rich mosaic of research about research, Points of Departure advances knowledge about student writing and serves as a guide for both new and experienced researchers in writing studies.